After a hugely successful launch party the Apt: collective return for a second instalment on November 4th, hosted by Shoreditch leading underground dance music venue Basing House. 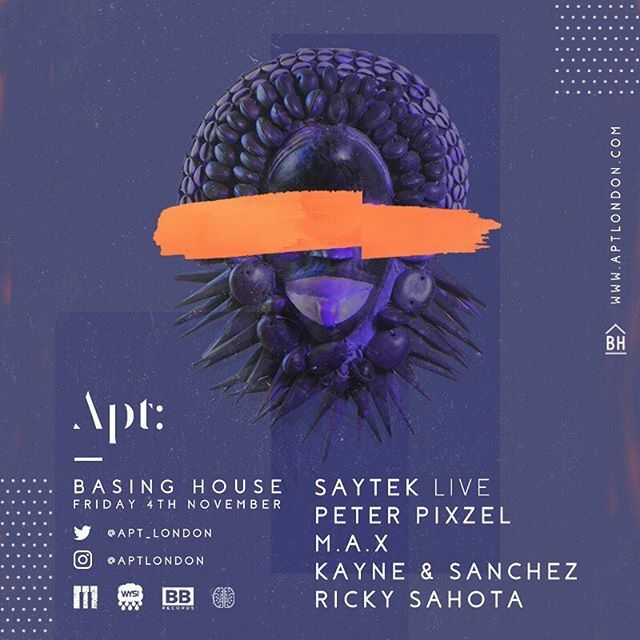 Our resident Saytek Live will be pushing the boundaries with his ground breaking live show, M.A.X one of London’s most in demand producers of the moment will be returning for his residency and we cordially invite WetYourSelf co-founder and fabriclondon legendPeter Pixzel to the stage. Supporting, we see dynamic duo Kayne & Sanchez plus Sub:Conscious Ldn head honcho Ricky Sahota makes his debut.On point music party people – we are a purpose together.